"Soviet Tactical Doctrine in WWII, As found in: Handbook on USSR Military Forces TM-30-340" with forward by S Caza. 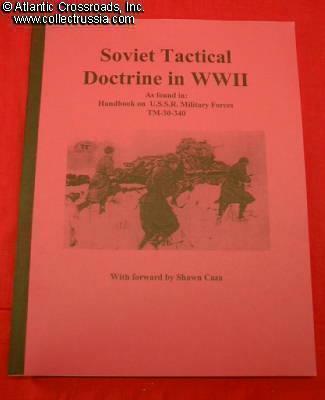 "Soviet Tactical Doctrine in WWII, As found in: Handbook on USSR Military Forces TM-30-340" with forward by S Caza. This is a reprint of US War Department examination of Soviet ground tactics, including the important support elements. It covers tactical command structure and role of intelligence (Part I), infantry tactics, artillery support, armored and cavalry tactics, and engineering and antiaircraft support (Part II), and special operations: river crossings, night operations, winter warfare, etc. (Part III). 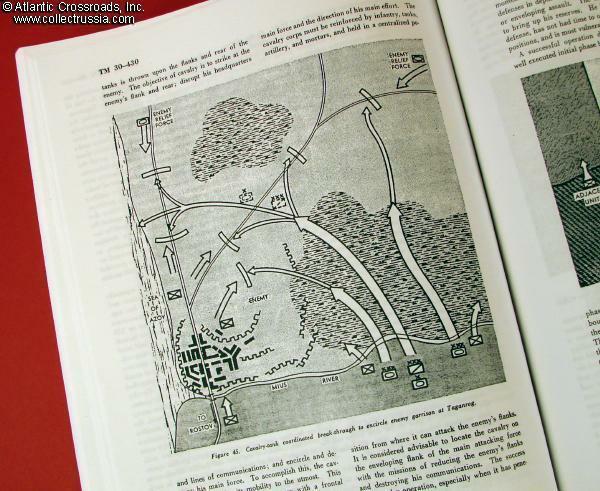 Similar in format to the "Soviet Order of Battle, WW 2" series (above), the book is soft covered, contains 146 pages of text and diagrams on regimental, corps, and army level tactics, dozens of illustrations.